Versatile self-inking date stamp with 12 phrases commonly used for office documents. 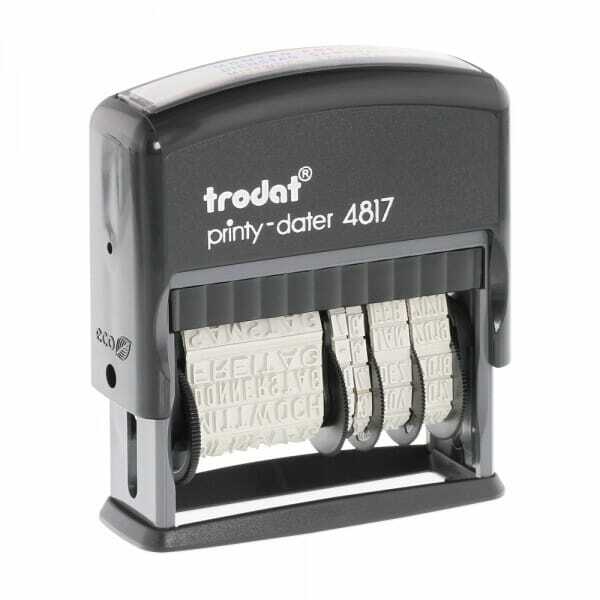 Trodat's Printy 4817 comes ready-to-use, its phrases include: Answered, Received, Entered, Backordered, E-Mailed, Paid, Cancelled, Checked, Shipped, Billed, Delivered and Faxed. Just turn the wheels of the band and select your required phrase. The text prints in front of the date. The date has the height of 3.8 mm and the format: day, month (in letters) and year. Customer evaluation for "Trodat Printy Dater 4817"